You are at:Home»Production»Feature: Are we ready for Poultrybot and Robochick? Feature: Are we ready for Poultrybot and Robochick? Three years ago, researchers at the University of Cambridge created an algorithm that used Facebook “likes” to determine an individual’s psychological traits. Their computer could reportedly judge personality more accurately than workmates, friends or even a spouse. The technology could even be used to decide which career path to choose or who to marry. These data-driven decisions “may well improve people’s lives”, the researchers said. Given the year Facebook has had, that might be jumping the gun a bit (the Cambridge Analytica scandal has put the brakes on big data, with people’s perceptions having swung firmly towards creepy rather than cool). But in agriculture the use of data, artificial intelligence and robotics continues to accelerate. Using microphones and mini GPS trackers, or sensors fixed to robots, farmers can monitor their livestock in more detail than ever before – and in real time. 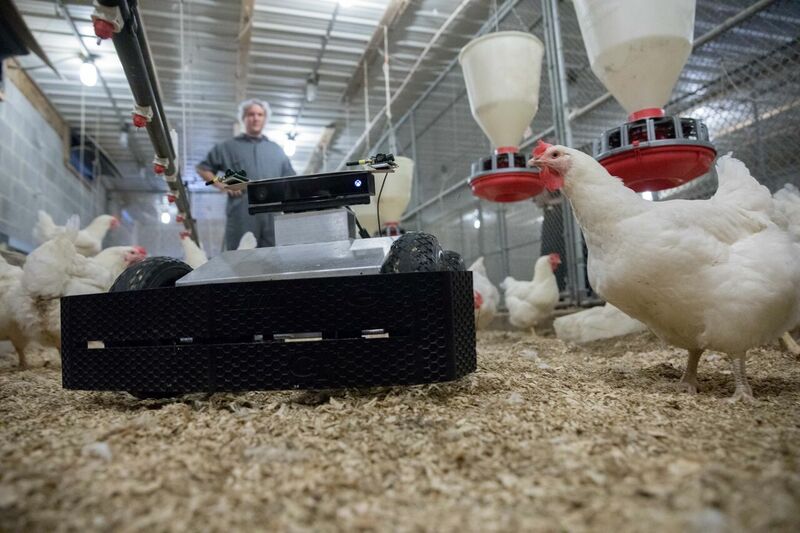 There’s new work underway to determine the impact that robots roaming about the buildings will have on day old chicks, two-kilo broilers and everything in between. Some farmers are even trialling the use of sensors to detect changes in the volatile compounds within shed that are a precursor to illness (apparently using a similar principle to the one that enables dogs to sniff out some cancers in people). Indeed, the benefits of big data, artificial intelligence and smart tech are reportedly legion: improved bird welfare, reduced use of antibiotics and better production. Technology could also plug the well-reported skills gap in the sector; it could even mean less work and more pay for producers. At Wageningen University in the Netherlands for instance there’s a “Poultrybot” that can meander through the flock picking up eggs. Meanwhile, in France, one poultry farmer has started his own company to search for practical solutions that will make his life easier and his chickens’ lives better: Spoutnic is a robot that moves around the flock to prevent lethargy and eggs being laid on the floor, reportedly cutting shed walk-throughs in half and savings thousands of Euros. But despite the potential, is the poultry sector ready to adapt to this shift and embrace the changes technology will bring? Indeed, Speller, who regularly tops Moy Park’s productivity league, doesn’t have time for those who say they’re “doing ok”. Those in the 400 club for production efficiency factor should be looking at the genetic potential of their birds and aiming for 450, he says. And with margins having dropped another percent, some are already closing their wallets to further investment. This could be short-sighted. As Dr David Llewellyn, vice-chancellor at Harpers Adams University, put it in his recent Templeton Report (The future skills needs of the poultry industry: developing its leaders, managers and technologists for the information age): “Retaining a focus on ‘traditional’ areas of expertise, such as nutrition and husbandry skills, while essential, may not be sufficient for a future where other industry sectors will be embracing technology at a rapid pace,” he wrote. The industry also needs to improve its “horizon scanning”, he said, as well as think outside the box when it comes to applying new tech from other sectors – advances that “might prove beneficial, even to the point of having a positive influence on consumer views about poultry production”. Indeed, trawl the internet for technological developments that will benefit the poultry sector and there is everything from on-site 3D printing of replacement parts and “nanny robots” used to detect ill birds to a virtual reality headset that gives caged birds the impression they are “free”. The latter isn’t entirely serious, the designer has suggested, but it raises important questions. “I feel like this is more of a design project, to get people to have a conversation about animal husbandry,” said Second Livestock founder Austin Stewart recently. After all, mortality rates in free-range birds are generally higher than for housed, whilst the environmental footprint of intensively-reared animals can be lower than those that are free-ranging. Could this be a humane and climate-friendly way to rear livestock? That’s a question for another day, but virtual reality has already been used in the sector – in 2016 McDonald’s used the technology to allow consumers to give consumers a “real-life glimpse” of how the food on its menu is made and where it comes from. The series of immersive videos included a trip around a free-range egg producer in Cumbria. But how far is the industry willing to go – are they willing to use technology to fling their barn doors wide open? In July, countryfile presenter Tom Heap proposed that webcams should be installed “at every stage of production”, with hyperlinks on packaging so shoppers can see where their food comes from. It could be branded “Candid Cockerel” or “The visible pig” he wrote in Radio Times. Dr Theo Demmers has just started a project at the Royal Veterinary College in London. “Robochick” is a feasibility study to determine whether a robot can happily trundle through a flock on its own taking readings from the environment without damaging the birds or being damaged by them. “You don’t want to run over a day old chick, but equally you don’t want to grind to a halt in a shed full of 2.5 kilo broilers,” he says. “So all we’re looking at is whether you can move a robot around the shed [autonomously]so it does nothing other than take readings.” Of course, if successful then it’s possible to start talking about the potential to improve bird welfare. For example, it might be possible to use the data collected to detect coccidiosis early and “stop it in its tracks”, says Demmers. With antibiotic use is in the spotlight and animal welfare a priority for consumers, farmers and food businesses, a lot of the work going on at the moment involves the early detection of health issues. Speller says the project he is doing involving sensors that pick up changes in the volatile compounds within a poultry shed could detect problems three days earlier than any microbiological tests. There’s also a project involving a robot that analyses droppings – it takes 10,000 images a day, with details of how wet the faces is, as well as its colour and shape, all of which help “predict what’s happening with the birds”. Some might say that an experienced farm manager could do pretty much the same job, but they don’t grow on trees. Indeed, the ability of technology to fill a gap in skills could be one of its most crucial benefits. “Labour issues will be a bigger driver [for technology]than money or margins,” says Speller. And artificial intelligence is already being developed to make the same decisions as a human stockman – perhaps even quicker, more accurate ones.